This course will be an in-depth study and practice in breath and pranayama. We will explore classic yoga breathing techniques in theory and practice, as well as the Traditional Ashtanga Yoga Pranayama practice. In addition to the general theory and practice, individual specific guidance will be given to each participant to progressively develop their own personal pranayama practice. 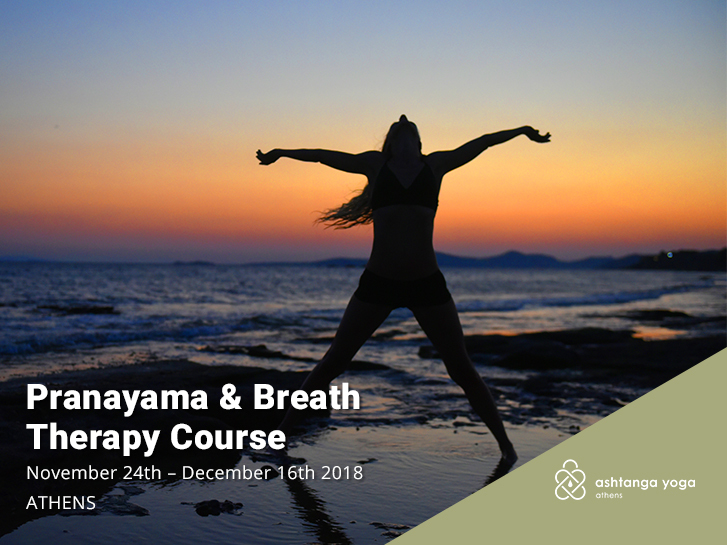 The course will be teaching the therapeutic use of breath, making the connection between the breath and our mental and emotional states. Participants will learn to observe and transform their own personal breathing behavior, leading to increase in PRANA and deeper mental and emotional stability. All Participants will be required to attend a Minimum of 2 pranayama practices per week during the duration of the course. In addition to the practices in the Shala, where instructions and guidance will be given, the participants will be expected to incorporate pranayama into their daily practice. Applicants for the course should have an established and regular yoga practice. This course may count towards your continuous education with Yoga Alliance International with a total of 50 hours.